View in PDF Sp. Issue A12 March 2018; page No. Inhibition of STX Virulence Factor Biosynthesis in Staphylococcus aureus by Thyme EO. Effect of antistaphylococcal activity of various essential oils against STX pigment producing Staphylococcus aureus. Induction of Mutation by Gamma Irradiation in Brassica comprestris L.
Fungi associated with the flowers of Spilanthes acmella (l.) Murr during storage. Effect of gamma radiation on various growth parameters of Linum usitatissimum L.
Phytochemical analysis and antimicrobial activity of Dendrophthoe falcata (Linn F.) Etting. leaves. 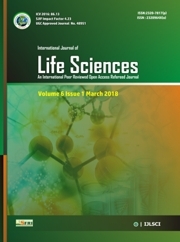 Anatomical changes induced by glyphosate herbicide in Hyptis suaveolens L.
Evaluation of phytoconstituents of Geodorum densiflorum (Lam.) Schltr by using UV-VIS and FTIR Techniques. Preliminary phytochemical analysis of Antidesma ghaesembilla L.
Habitat destruction of local hedge plants of agricultural field by the modernization of agriculture in saoli region. Honey bees, diseases in loss of social immunity by changing climate.